How is a Christian supposed to talk with an individual deeply committed to another religion? How is the Christian to appropriately respect a person’s religious convictions while holding to the exclusivity of salvation found in Jesus Christ? How should a Christian relate the details and nuances of another religion to the truth claims of Christianity? It is for questions such as these that Daniel Strange tries “to develop and deploy a biblically rich and nuanced theology of religions” (32). This effort culminates in the UK and US publication of Their Rock Is Not Like Our Rocks (henceforth, Their Rock). Their Rock starts with some clarifying bluntness. Strange states that “evangelical theology of religions has been stunted in its growth” (32). He believes this has occurred due to justified, but nevertheless over-focused, defenses of “the exclusivity and uniqueness of Christ” and “questions of soteriology” (32). Other religions have been properly excluded but not explained. Quoting Peter Leithart, Strange provocatively asks ”Can Christians make theological sense of the persistence of Islam? Can we fit them into our story?” (32). If these questions sound strange or misplaced to evangelical ears then Strange’s observations are confirmed. In a growingly pluralistic world, evangelical theology needs not only explain Christianity but also the religions it interacts with in its gospel mission. It is within this evangelical framework, and focus on missions, that Strange provides a theology for other religions. This theology includes a look at their origins (chapters 3 & 4), the roots of idolatry (chapter 5 & 6), the gospel as subversion fulfillment (chapter 7 & 8), and pastoral perspectives and concerns (chapter 9). A systematic theologian in nature, Strange finds himself with the task of harmonizing many different fields outside of his direct expertise. Acknowledging this fact, Strange utilizes the works of other theologians frequently. He even included valuable insights from those that he ultimately critics (this is best demonstrated in chapter 5 on idolatry and the Divine name). An evangelical exclusivist, Strange also speaks from a specifically Reformed, presuppositional, and missional position that leans heavily on the works of Hendrik Kraemer and J.H. Bavnick. Strange uses these men’s exegesis, theological synthesis, and concern for missions to provide significant depth to many subjects and passages. Strange starts his theology of religions in traditional places. By correlating Acts 17:22-31 with the biblical history in Genesis 1-11, Strange lays out a set of presuppositions about creation and God as Creator. This interaction has many important points but none more crucial than the fall and “false faith” (72-78). It is this concept of false faith along with the idea of “remnantal revelation” (chapter 3) that begins to clear that path for a “genesis” of other religions. Strange argues that from Adam to Noah God’s revelation was both general and special in that it came directly from God unto all mankind. This revelation was passed down and was the remnental revelation prevalent at the tower of Babel. Strange argues for this remnental revelation using both theological reflection and “prisca theologia” (103-120). This section, and its inclusion of presuppositional thought from Cornelius Van Til, explains the convolution of remnental revelation into different religions via the confusion of language and idols at the tower of Babel (chapter 4). After this discussion, studying post-Babel and patriarchal religion centers around the pluralistic-exclusivist debate that exists even among evangelicals (chapter 5). It is here that Strange incorporates some fine theologians, with a special nod C. J. H. Wright, to provide critical insights to patriarchal understanding of YHWH and pre-Exodus pluralism (157-183). The involvement of these progressive theologians and Strange’s subsequent critical analysis builds a theology against pluralism that avoids superficiality or shallowness. This sets the important tone for salvation by faith in Christ against the inclusivist theologies of evangelicals such as Amos Yong and Clark Pinnock (chapter 6). As Strange returns to the missional nature of his theology of religion the thinking of Van Til again takes center stage. The presupposition that other religions are working on “borrowed capital” from the true God is crucial to presenting the gospel in this context (chapter 7). It is here that Strange explains the ideas of the Christ’s gospel and subversive (268-270) and fulfillment (270-273). The gospel of Christ stand opposed to the perversion of revelation in other religions while actively fulfilling the residual elements of true revelation. This is the fruit of Strange’s work and is immensely practical. After some time explaining ecclesiological contextualization (chapter 8), Strange provides an example of this gospel subversion-fulfillment for Sunni Islam (294-300). Without Van Til’s idea of remnental revelation, or imago Dei, these elements would be less convincing. It is worth noting the Christians of different epistemologies may struggle to grasp or agree with everything Strange presents at this point. Strange concludes Their Rock with a chapter on the purpose of other religions (chapter 9). This is to answer the practical question “Why does God permit false religions?” Despite the entirety of Strange’s thought being distinctly Reformed, this chapter displays the more familiar Reformed doctrines of soteriology and predestination. Though insightful, the reliance on Reformed thought from Romans 9-11 will provide a major split for some evangelical readers. 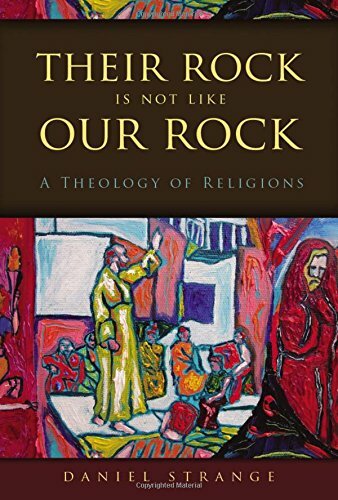 In conclusion, Their Rock Is Not Like Our Rock is a tour-de-force of Reformed theology towards other religions. It is subversive to shallow evangelical thought and willing to address the critical analysis of more pluralistic theologians. It addresses the important questions of other religions within the realm of Scripture. Strange successfully expands the evangelical tradition without giving up exclusivity. Coupled with shedding light on old Reformed teaching as well as more modern thought, Strange’s work paves the way for future discussions (something he specifically calls for in his concluding thoughts, 335-338). Strange’s efforts should become essential reading for future students.